Many thanks to Rod Lamkey of the Washington Times for the recent article on the Gunpowder River that appeared in the Washington Times, Washington Weekend on August 30, 2007. The article focused on the Gunpowder River, stream manners, women in fly fishing, and effective fly patterns. It was a pleasure working with Rod on this feature article! This entry was posted in news on August 31, 2007 by Theaux Le Gardeur. Yesterday the river dropped to 111 Cfs, an ideal level for wading and fly fishing dry flies only 30 minutes from downtown Baltimore, Maryland. Water temps are 61-64 troughout the catch and release section. Tricos before 10:00 AM from Falls Rd through Masemore Rd Access. Fishing Saturday morning @ Falls Rd was a charge. Fish were sipping fast and furiously early and what a time. You could see them come up time after time. Didn’t know where to cast next. Tricos until about 9 and as it tapered tried a gnat pattern and stretched the top bite for a little while longer. Saw some action tight to the opposite bank as well. One of the more enjoyable outings recently. A pair of courteous kayakers who passed behind me despite the shallower water around 10:30 and only one other fisherman working his way up from below the bridge. A quiet summers morning, good flow of cool water on a hot day, exciting fishing action…What more could one ask for ? See you all next time around. This entry was posted in fishing report on August 31, 2007 by Theaux Le Gardeur. I am now offering float trips on the Gunpowder River to take advantadge of the better flows and cooler water temperatures in September. Access will focus on areas where pressure is lightest, and rest assured, the wild browns are plentiful. 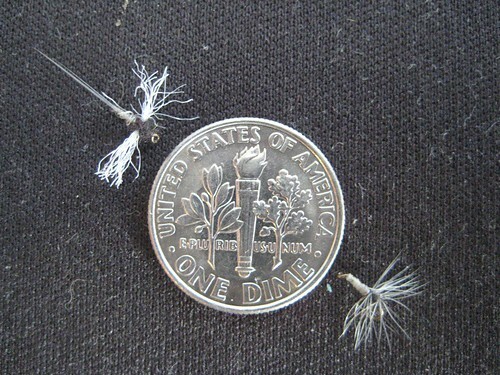 Streamers, dries and even nymphs can be drifted through runs as the boat floats and we will wade some of the best riffles and pools to allow more time for hookups. 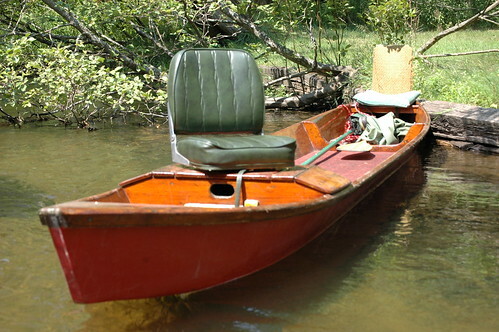 Expect to fish while seated in a comfortable chair and the longest casts need only be thirty feet off the bow or stern. Streamers are always producers. We typically moved some good trout while stripping these flies through miles of water. A stout nine foot four or even six weight streamer rod is a great choice for anglers looking for the most action or best shot at a fish over fourteen inches. I usually bring a pre-rigged dry fly or streamer rod for clients to use if they want to switch as we float through various pieces of water. I will provide lunch and a few “producer” fly patterns and can accommodate two anglers. This is not only a relaxing, fun way to see and fish the river, but a great western river primer for anglers who have yet to fish out of a drift boat. Learn some techniques to help prepare for the faster pace of drift boat fishing anglers encounter on a western float. Trips average five hours depending on the amount of wading time, but could be a straight three hour nonstop float. 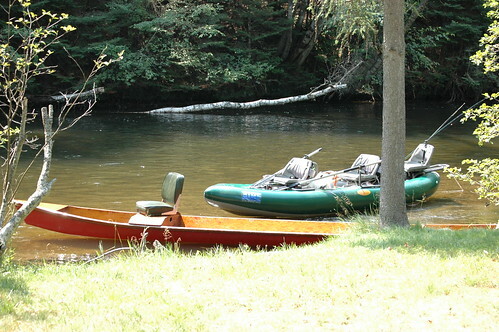 Float trips are priced at $275.00 for one angler and $375.00 for two anglers for a five hour float. Waders, boots, rods and reels can be provided for beginning anglers, who I welcome to float, Although, anglers that have some experience accurately casting flies near cover will be more successful from the boat. Weekdays and early weekend start times can mean quieter water until cooler weather chases off the majority of weekend boaters and tubers. This entry was posted in news on August 27, 2007 by Jason du Pont. I recently made the journey from North Baltimore County, Maryland to the Grayling area of Michigan. Matt, a Gunpowder regular joined me for the 14 hour drive across several states with my raft in tow. Nick, a Michigan native and former college chum of Matt was waiting at what felt like the farthest northern tip of the state. We pulled in his cabin’s drive around 1:30 a.m., but he wasn’t there. He pulled in ten minutes later and said he just got done mouse fishing. “Rolled two fish,” he said. Mouse fishing at midnight puts me a little out of my element, but we had five days of fishing before we had to head east again. I’d try to adjust. Our first morning we arrived on the small North Branch of the Ausable River, that looked oddly enough like the Masemore section of the Gunpowder with flat slicks, tree falls and flat riffles. I heard the words uttered in a local fly shop not hours before that “these are wild fish, not likely to bite under the midday sun, but you can still catch a few ten to twelve inchers on a beetle or hopper.” Things started sounding all too familiar. We put in and floated that day and every day after on different branches, and finally the main stem. Probably floated twenty five miles in total. The North Branch provided scenic views of trees and clear water with long green waving tendrils of grass. 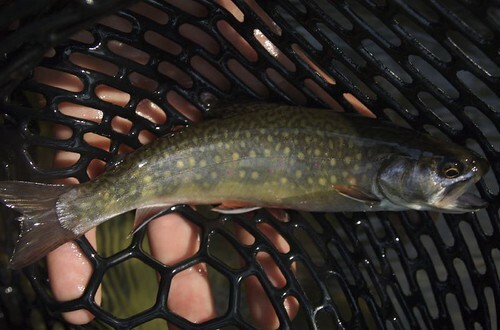 The brook trout were aggressive and many taking beetle, ant and caddis imitations. The occasional brown would show its face, but this branch was not known for really big fish. The best fish may have topped out at 12 inches, but we had just seen four miles of totally new water. The next few days we fished small mouth on the lake the cabin was on, floated the bait stretch of the main branch of the Ausable with a local guide and friend of Nick’s. We waded the Manistee in the afternoon, choose our pools, set up camp and returned sometime around 11 p.m. Headlamps were strictly forbidden if you wanted a serious shot at a trout over 22 inches. I pulled the 2X knot tight on a freshly tied deer hair mouse pattern and it was lights out until we all hooted and began sloshing our way to camp around 12:15. You essentially swing the mouse and locals advise as much action as possible to entice a strike. None of us had felt a thing, except the excitement of wading in the dark in a good sized river. Fly fishing totally blind is pretty tough. We floated the Manistee the next day, hearing stories at the put in of huge trout by anglers who had just finished mouse fishing hours ago. We did see one enormous 25 inch plus trout sulking in the hollow of a weed bed and we pulled off to rest him, but he refused my two drifts with a nymph and slid farther into the grassy beds. Some strange similarities of the Ausable and the Gunpowder kept showing themselves to me. Long forty foot wide riffles and glassy flats were common for many miles until small bends narrowed them. We got caught in a frenzy of rising fish on Tricos one morning at the put in, although few were larger than six inches. A good sized trout was twelve inches, and they were awfully hard to catch. The truly big fish in Michigan were caught on large streamers ,Hexs or mouse patterns. As always the bigger ones we hooked all got away. The final float day we took some advice to fish the “big water” and it turned out to be the best and worst day of the week. We caught more fish than we could have ever wanted, but the catch was you had to roll cast to avoid hooking hundreds of nearby canoers. It was the wildest thing I ever saw, and is by far my most memorable day of the trip. For a good laugh watch the video, and realize this went on for hours. We were more afraid of hooking tubers or being run over by canoes than them affecting the fish. Recognizing a good fishery is an angler’s hardest task. We missed the Hex hatch by months, whiteflies by days and the first run of salmon by about a week. The trip was productive, we caught fish each day, avoided any major problems and never fished anywhere twice, except one area that was some of the best looking water I have ever seen anywhere. We caught glimpses of the river’s worth when we nymphed four fish from one hole, or when I tied on a size 26 midge and begun to work through all the trout that were now greedily rising, but formerly refusing. 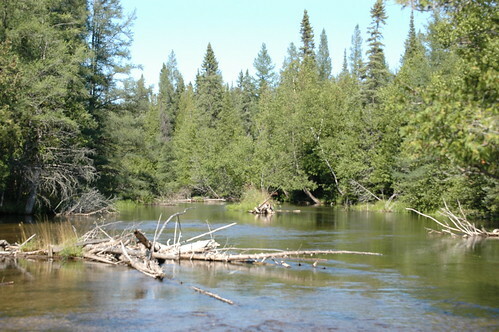 Michigan has some incredible branches and stretches of the Ausable river, just one could require years to learn. This entry was posted in fishing report on August 27, 2007 by Jason du Pont. On a recent float trip down the Ausable River in Michigan three anglers encountered the most prolific aluminum hatch ever documented on film. East coast anglers may find these “hatches” are spotty at best in comparison on most of their local waters. Brown and rainbow trout were biting subsurface and our indicators barely floated for thirty feet in the better runs. The screams and splashes didn’t bother the trout, but line management was taken to a whole new level to avoid hooking anyone. Personally my biggest concern was being run over while wading, as I was constantly playing a game of river Frogger to avoid the silver bullets and raft parties. Fly fishing throws many challenges at anglers, and all too often it is easier to make excuses than to adapt to tough conditions. We answered “how’s the fishing?” a few hundred times before agreeing to a nonverbal response or lifting the rod in a well timed triumphant hook set. When hooked the trout headed to the nearest structure, usually tubers legs or canoe paddles. The fish seemed to enjoy the shade provided by six to ten canoes lashed together, in what I call a “warship.” The huge party boats consisted of rafts, tubes and air mattresses tied together, and some nearly spanned the width of the river. One huge raft pile I dubbed Bikini Island for obvious reasons. We heard local river float songs, got cheered on with each fish on the line and turned a few heads in the AIRE boat. We netted fifty trout between three of us, and an unopened can of Busch Light, which was highly prized. The action was constant and each of us briefly hooked up and lost ten to fifteen additional trout. The trout were gorging themselves on caddis pupaes, SJ worms and streamers. When I saw the first 100 people pass I thought about how many people complain about the Gunpowder floaters. I have caught fish on many rivers with heavy floating on weekends and notice how little they affect the fishing. Trout are more likely to spook when a dark figure inches ever closer at a heron’s pace splashing line onto the water over and over, than when two to three pairs of legs bob down the river every ten mintues. By day’s end it became apparent these people do this every weekend all summer and the trout are no longer bothered. Once the floating pressure lightened the bite slowed significantly. I think the water was no longer being stirred up by dangling feet, which put the fish on the feed. The end of day brought solitude, quiet and the occasional fish before the takeout. It was a day I will not soon forget. This entry was posted in video on August 27, 2007 by Jason du Pont. Not much progress to report on the rod this week because I just got back from a week in the wilds of western North Carolina. I fished a little bit while I was down there but many of the streams I saw were low and warm and the ones that weren’t low turned in to a river of clay-colored slurry as soon as anyone even mentioned rain. I realized how spoiled I am with the Gunpowder River just a 30 minute drive from my house in Baltimore City. Even after a heavy rain the upper river is never more than slightly off-color and the cold water has held out year after year. What a incredible resource this river is! Well, enough about all that. I mentioned in my last post that I’d talk about some of the tools bamboo rod makers use. 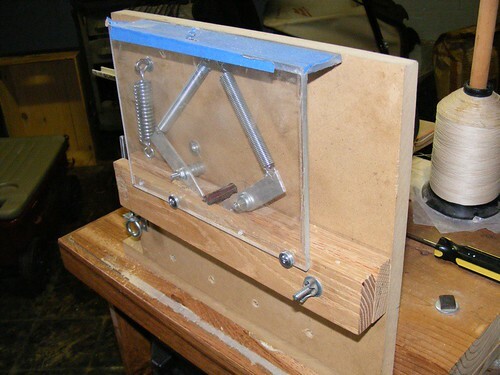 So far the pictures have shown my Milwaukee heat gun and wood worker’s vise. Pretty boring stuff. This week we’ll check out my router powered beveler. This is a serious tool! 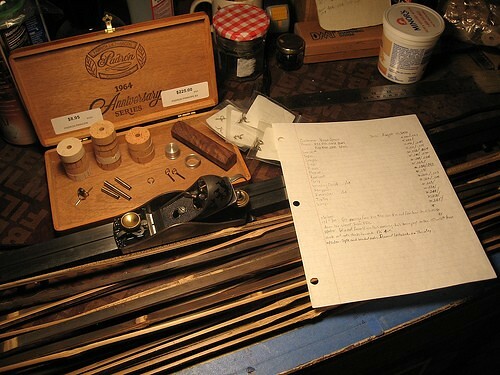 It’s a home made version of a beveler designed by another rod maker named named Al Medved. As you can tell from the pictures the router mounts horizontally and the bamboo is fed through an adjustable wooden bed that sits below the blade. The bed holds the bamboo at the right angle as it goes through the beveler. The beveler helps save time and a lot of hand planing by cutting the initial 60 degree angle in each strip. How much time? About 5 hours worth of planing and about 30 minutes of blade sharpening. Aside from my home-made lathe this is the only power tool I use in the construction of my flyrods. Everything else is done by hand. All of the primary and final planing of each strip is done one strip at a time with my trusty Stanley #9 1/2 black plane which is about 50 years old. In my next post we’ll check out the most important tool for making bamboo planing form. This entry was posted in gear, news on August 27, 2007 by Bill Felter. The Gunpowder river is flowing at 156 Cfs, water temps are in the 60-62 F range throughout the catch and release section. We’ve had steady trico hatches from 7:30 till almost 10:00 just about every morning. The barn swallows are happy, the fish are eating, and you should make time to fish before the you have to start shopping for school supplies. Caddis are present along the river about mid-morning in the #16-18 range and are a great fly to switch to after squinting through the trico hatch. By late afternoon, grasshoppers and ants cast dangerously close to the banks should elicit a few strikes. If you’d like to fish tricos, a size #22 to 26 fly is in order. Don’t bother with the riffles, instead seek out some flat glassy water and be prepared to tie on some 7 and/or 8x. Ten to twelve foot leaders are a good place to start, and yes, we do sell 15 ft 7x tapered leaders and they do turnover. Saw Jason’s Savage River article in Eastern Fly Fishing … great job! Looks like you’ve got a modern day Gaddabout Gaddis in your stable. Was having an excellent day above Monkton yesterday before the rain drove me off. The fish are really bright and healthy in that stretch. Took the first few on a tandem nymph rig, but switched over to a Harrop adult caddis (a dubbed body/CDC underwing/tent-style Medallion sheeting wings/brown hackle) when a hatch started them coming to the surface. Landed a couple, including a beauty just under 15″, when it got really dark and started to pour. Vive le flow rate! This entry was posted in fishing report on August 27, 2007 by Theaux Le Gardeur. Fly fish the Savage River and the North Branch of the Potomac River with a Maryland Licensed Guide on October 4 and 5. During your Backwater Angler Overnighter, you’ll enjoy a day and a half of guided fly fishing in Western Maryland, an overnight stay in a stream side cabin and have three meals on us for $550 per person. This entry was posted in events on August 24, 2007 by Theaux Le Gardeur. Fly fish the Savage River and the North Branch of the Potomac River with a Maryland Licensed Guide on October 3 and 4. During your Backwater Angler Overnighter, you’ll enjoy a day and a half of guided fly fishing in Western Maryland, an overnight stay in a stream side cabin and have three meals on us for $550 per person. This entry was posted in events on August 23, 2007 by Theaux Le Gardeur. Fly fish the Savage River and the North Branch of the Potomac River with a Maryland Licensed Guide on October 2 and 3. During your Backwater Angler Overnighter, you’ll enjoy a day and a half of guided fly fishing in Western Maryland, an overnight stay in a stream side cabin and have three meals on us for $550 per person. This entry was posted in events on August 21, 2007 by Theaux Le Gardeur.